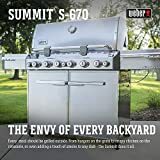 Stainless steel grills are the best of all grills, but the wrong one can make grilling a nightmare; so it’s wise to get the right stainless steel grill. A high-quality grill is made with food grade stainless steel and very well built. Want to get the best stainless steel grill for $1000 bucks? Here is a list of the top five. The Genesis II S-310 by Weber is the one most grilling aficionados love. Its high-performance burners allow you to grill different foods simultaneously while its stainless steel flavorizer bars ensure your food retains all its flavor. Blackstone’s 60,000-BTU gas grill griddle has a 720-square-inch cold rolled steel grilling area. With it, you can cook anything – from breakfast to dinner. Its high-quality material makes it super easy to clean. You will love the price of the DGE Series Propane Grill by Dyna-Glo, which is the lowest on this list. Its four stainless steel burners churn out 40,000 BTUs of heat and its 12,000 BTU burner is perfect for your side dishes. 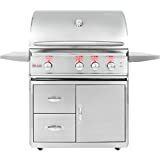 Looking for a stainless steel gas grill with a rotisserie burner? Get Monument Grills’ 60,000-BTU five-burner grill that comes with a rotisserie kit. Its massive 723 square inches of cooking space, enclosed cabinet, and side shelves are all made of stainless steel. 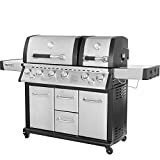 The 3 burner gas grill by Chef’s Grill spits out 36,000 BTUs and has a 430-gauge stainless steel firebox exterior, push-button electric ignition, and a vented hood liner that expels smoke and ensures there aren’t blasts of hot air when the hood is opened. 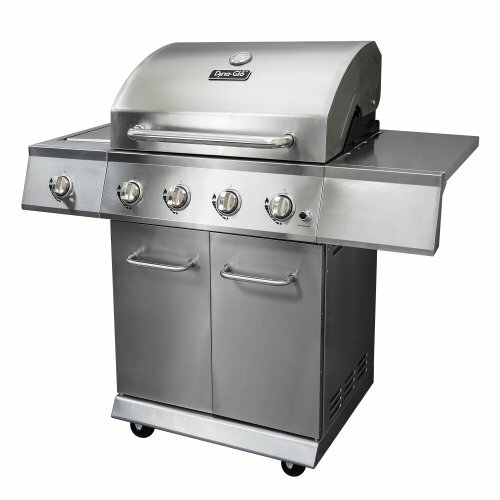 Chef's Grill RT2417S-1 3-Burner 36000-BTU Liquid-Propane Gas Grill, Stainless Steel, 552 sq. in. Do you smell that intoxicating smell? You know the one: a freshly marinated steak, charred veggies, or even the aroma from a perfectly grilled chicken. You don't smell anything? Well, that's because you aren't the proud owner of a Monument Grills Stainless Steel 4-Burner Gas Grill w/ Rotisserire. This grill is the perfect solution to those summer grilling blues. Thanks to 4 main burners, 1 side burner, and 513.3 square inches of cooking area, this grill can handle all the tasy food you can throw at it. With it's propane gas compatibility, you no longer have to worry about fiddling with pesky and hard-to-light charcoal. Best of all, courtesy of the attachable rotisserie, chicken, lamb, and turkey has never been easier to prepare. From the pilotless ignition to the built-in thermometer, this Monument Grill keeps the users in mind and is sure to provide an enriching grilling experience for many backyard barbecues to come! The GS4 high performance grilling system sets a new standard in the world of backyard cuisine, & Lands the Genesis II in a class of its own. This innovative grilling system is based on over 30 years of grilling experience, culinary expertise, & most importantly, avidly considering the wants & needs of the people who matter most - the grilling community. Each component of GS4 was uniquely designed for ease-of-use & to provide an unequaled satisfaction to your backyard grilling experience. Promising burners that are ensured to ignite every time, smoke infused food that grills evenly & consistently regardless of where it's placed on the cooking grate, & hassle free cleanup; you are able to focus on what it's is all about - bringing people together around the grill. The GS4 grilling system is composed of four key components: the Infinity ignition, high performance burners, Flavorizer bars, & grease management system. These components ensure that every aspect of your grilling experience is easy & reliable; from the moment the burners are lit to the general maintenance of your grill. & together, create the strongest grilling engine within this Genesis grill. As outdoor enthusiasts and founders of BLACKSTONE we dreamed of a quality outdoor griddle and/or grill that could cook for large groups and families. In 2005 we made our vision a reality by creating BLACKSTONE PRODUCTS. We then launched the 36” BLACKSTONE griddle that is still popular for backyard cooking and which brings families and friends together for fun and food. Our spectrum of gas griddles and gas grills are popular for backyard living, a BBQ, recreational cooking or commercial grade cooking. Since then, the company has expanded dramatically and created a brand new look as well as a large new line of durable rugged innovative and portable cooking innovations including an outdoor pizza oven and the ever so easy to transport and set-up DASH – and our products will last a lifetime. By using the latest technologies available and complementing them with our own innovations, we feel we have the leading edge on the market in our categories. Our products are designed and engineered in the USA by people who are avid users and live to entertain outside – at home, in the tailgater parking lot or just about anywhere. We pride ourselves on the quality of our products and how well they function while keeping the prices very affordable. We have assembled a strong and enthusiastic team with the utmost passion for BLACKSTONE and outdoor cooking including excellent engineers, intelligent industrial designers and uniquely creative graphic artists. We have the capability to make any adjustments to our current lines or create new units all together, tailored around your needs in a very short time in contrast to our larger entrenched old-school competitors. So look forward to future innovations from BLACKSTONE sooner than later. We are more than just another outdoor cooking appliance company that only focuses on the numbers and overlooks the end users by neglecting quality or deferring to accountants. We are here to stay and hope you enjoy BLACKSTONE products as much as we do. 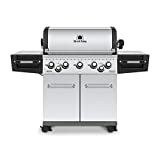 The chef's grill new Brand, backed by family grill design innovation since 1975 RT2417S-1 model is a 675-square-inch 36,000-btu (3) stainless-steel burners. Two grates & one 142 sq. In. Warming grate. 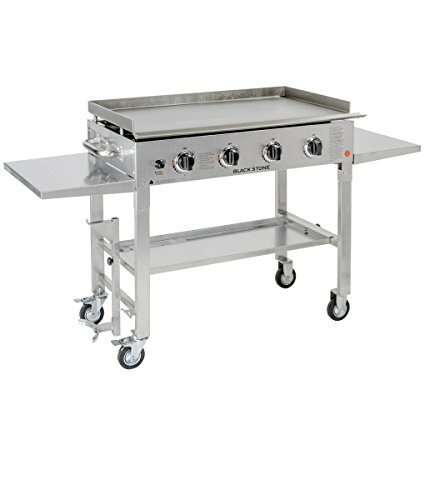 This LP gas grill is silver/stainless with casters. it uses a proprietary cooking system that keeps meat naturally moist & tender, even when cooked to well-done. Our "flavor step" tents are louvered to hold drippings & re-vaporize the juices. This also acts as a heat deflector to protect the burners 10 year warranty. 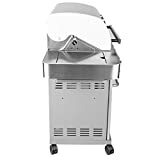 The RT2417S-1 uses an exclusive cooking system with a vented hood liner that removes smoke from front to back, expelling vapors out the back. This also eliminates blasts of hot air when the hood is opened. This cool feature also helps keep the stainless hood from turning color & lowers the hoods touch temperature, by directing the airflow away from the hood, it helps lock in food's natural juices & reduces cooking times. The heavy 7mm grilling grates are stainless steel. 675 square" of total cooking space, three 12,000 BTU stainless steel burners. Virtually nonstick. 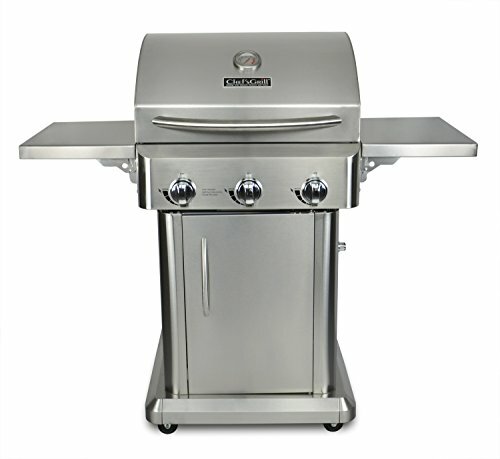 This grill has the 430 Gauge stainless steel firebox exterior with seamless welded lid. Grate-level easy to read temperature Gauge for greater accuracy. Separately controlled cooking zones let you grill a succulent filet to perfection while simultaneously cooking mouthwatering Shrimp at a lower temperature. Push-button electric ignition for reliable Start-Up every time. Uses one AA battery. Wow, this is cool. Our UL patented safety tank ring is designed for no stooping to release the tank at the base. Our ring grasps the tank by the collar, making it impossible to dis-lodge the tank from the grill. Uses a 20lb LP cylinder (not included) LPG regulator & hose inside. The two folding side tables make this grill measure 51.2" wide folded out & 32" folded down. Made to last. Made to cook. Delicious outdoor fun. The joy of grilling. Enjoy! Integrated temperature gauge for accurate grill zone temperature measurement, Note. The side tables will not fold down. 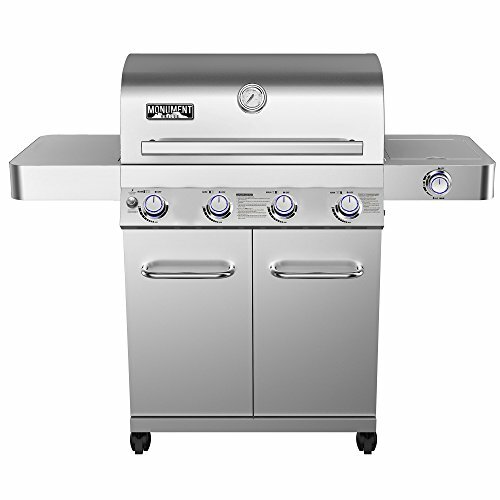 Performance and design go hand-in-hand with this stainless steel, 4 burner gas grill with side burner from Dyna-Glo. With a total of 52,000 BTU's, this grill provides plenty of grilling power for cooking just about any type of food. The lid is double-walled to minimize heat loss and improve the cooking efficiency of the burners.